Get your guests excited! Three to four weeks before your guests would leave, send them a little personal gift to get them excited for your big day! One idea is to send them a personalized luggage tag for their travels that is both specific to them and your wedding theme. Another option is to send something country specific for a little pre-wedding treat that will have them looking forward to their arrival. Reception and Ceremony Decoration: Inspired by your country of choice, add some special touches that connect your ceremony or reception to the country’s culture. 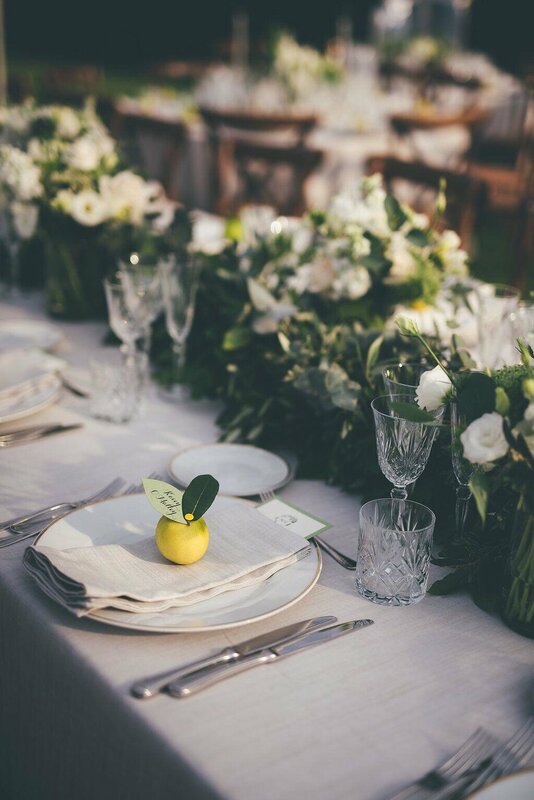 For example, in Italy, the lemon is often incorporated into wedding design for a simple Italian touch. In addition, don’t forget to add little mementos of your relationship to add those priceless personal touches. Rather than photo albums and photo frames, consider a slideshow, video, or digital options to showcase your journey as a couple to save space without sacrificing adding a part of you to the wedding. At the end of the day, Savvy will be sure to put your needs first. It’s our mission: “Your event, my experience, your way.” We have the connections, the information, and the knowledge of Italy to give you the best suggestions possible as you plan your wedding. Between our resources and your ideas, we will be the perfect team!